The owner of a mining dam that collapsed in Brazil last month, killing 165, knew it was at a heightened risk of failure, Reuters claims in a report. 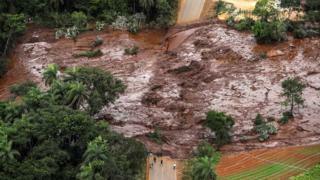 According to an internal report seen by the news agency, Vale was aware the Minas Gerais dam breached internal safety guidelines in October. Vale, the world’s top iron ore miner, said the report was misleading as there was no evidence of imminent risk. “There is no known report, audit or study with any mention of an imminent risk of collapse at Dam 1 in the Córrego do Feijão mine in Brumadinho,” it said in a statement. The incident at Brumadinho dam is Brazil’s deadliest mining disaster, with many workers still unaccounted for and with some 300 people feared dead. It was the second major mining disaster in the region since 2015, when a nearby dam co-owned by Vale collapsed. According to the internal report seen by Reuters, Vale was told the chance of collapse at Brumadinho was one in 5,000 – twice the maximum level of risk allowed under company guidelines. The report placed the dam within an “attention zone”, saying that “prevention and mitigation controls” should be applied. However, this audit report, also seen by Reuters, raised a number of concerns, particularly about the dam’s drainage and monitoring systems. Shares in Vale extended their losses in New York on Monday following publication of Reuters’ story. The company has lost a quarter of its market value – or nearly $19bn – since the 25 January disaster. Why is the pound so low against the euro?